Wan Abdullah showing the Imperia Condominium Tower model at the company’s property gallery in Singapore, the project is now being developed at Puteri Harbour in Nusajaya, Johor. SINGAPORE: UEM Land Holdings Bhd will be launching its new multi-billion ringgit integrated mixed development project known as Nusajaya Gateway this year. Managing director and chief executive officer Datuk Wan Abdullah Wan Ibrahim said the 1,821 ha parcel would be the last “remaining big fat land” slated for development in Nusajaya. He said the company had presented the development plan to Johor Mentri Besar Datuk Abdul Gani Othman and the state planning unit and that the Johor government had given the nod the the project. “The development will keep us busy for the next 25 years with an estimated gross development value (GDV) of about RM18bil as of to date,'' said Wan Abdullah. He was speaking at a press conference on the opening of the UEM Land Property Gallery in Heritage Place here yesterday. Wan Abdullah said however, the company would review the GDV from time to time. He added that it would probably be higher than the estimated figure in years to come. He said the land was located just few metres away from the Sultan Abu Bakar Custom, Immigration and Quarantine (CIQ) Complex at Tanjung Kupang in Gelang Patah. Wan Abdullah said the land was divided into two parts with the large parcel located on the left side of the CIQ for motorists coming from Tuas in Singapore and the other parcel was on the right side of the complex. “We have identified several catalytic projects on the land and these include education, eco-tourism and leisure,'' he said but declined to give details on the other signature developments. Wan Abdullah added that Nusajaya Gateway's signature development would be different than those at Nusajaya presently but they would be complementing instead of competing with each other. He said the development would comprise of residential and commercial properties with low and high-density living and that focus would be given on preserving the area as it is located near to mangrove area of Ramsar site. Meanwhile, a senior official with UEM Land told StarBiz that the company was currently talking with several local and foreign investors who had expressed their interest in the project. “By having joint-venture with other parties, it will help to fast track the development as they could bank on each other strength in undertaking the project,'' said the official. The official added that Nusajaya Gateway's close proximity to the Second Link Crossing and Tuas checkpoint would be an added advantage in marketing the project for Singaporeans and foreigners living in the republic. UNITED Malayan Land Bhd (UMLand) plans to develop several property projects in the Iskandar development region in Johor with a gross development value of RM1.4 billion over six years. UMLand director Datuk Syed Ahmad Khalid Syed Mohammed said construction on the mixed development project in Medini, Iskandar, would start soon. It is targeting local and foreign investors. "Under phase one, we plan to build commercial properties such as hotel, serviced apartments and retail buildings," Syed Ahmad told reporters here yesterday after inking the deal with Iskandar Investment Bhd. The latter was represented by its president and chief executive officer Datuk Syed Mohamed Syed Ibrahim. Syed Ahmad said the company still negotiating with Iskandar on the land size that it could buy for the project. UMLand chief operating officer Lim Eng Kuan said the proposed investment could boost Medini's attractiveness as an investment hotspot as well as complement its Bandar Seri Alam flagship project within the Iskandar region. He added UMLand had already bought several parcels of land in the Iskandar region measuring 404.6ha, earmarked for industrial, commercial and residential development. This will ensure the continuity and growth in the future earnings for the group. Medini is located within the Nusajaya development zone, which is one of the five flagship developments of Iskandar, touted to be the country's engine of growth in the southern region. Comprising an area of 902.8ha, Medini is one of Nusajaya's eight catalyst developments. Others are Johor's new administrative centre, Puteri Harbour, a southern industrial and logistics cluster, Afiat Healthpark, Educity, an international resort and Nusajaya residences. PETALING JAYA: United Malayan Land Bhd (UMLand) will hold negotiations with Iskandar Investment Bhd (IIB) about investments in Medini, Iskandar Malaysia. The developer said in a filing with Bursa Malaysia yesterday that it had entered into a collaboration agreement with IIB to talk about its proposed investments in the flagship project. Located in the Nusajaya development zone, Medini is one of the five flagship developments and part of the eight catalyst developments of Iskandar Malaysia, in addition to Johor State New Administration Centre, Puteri Harbour, Southern Industrial and Logistic Cluster, Afiat Healthpark, EduCity, International Destination Resort and Nusajaya Residences. Syed Mohamed: Medini is well positioned to become the central business district in Nusajaya. IIB president and chief executive Datuk Syed Mohamed Syed Ibrahim said in a press statement that the 2,230-acre Medini is well-positioned and on track to become the central business district of Nusajaya. “The proposed investment by UMLand, one of the renowned property developers in the local real estate industry, does not only reflect the attractiveness of Medini as an investment hot spot but will add a new dimension to the vibrancy of the lifestyle development,” he said. UMLand chief operating officer Lim Eng Kuan said that UMLand had been a major player in the Johor property industry since 1990, starting with its first development Bandar Seri Alam. “Over the years, the group has made concerted efforts in collaboration with the state government and has seeded vast infrastructure and amenities allowing the group to spread its wings further in Johor. 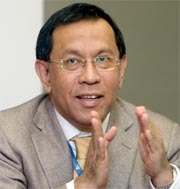 “This can be seen in the group's strong presence in the region with projects in four out of five flagship zones of Iskandar Malaysia,” he said, adding that the group had also acquired several parcels of land amounting to 1,000 acres in the Iskandar region, earmarked for industrial, commercial and residential development. It was recently reported that Medini's Arab investors would look to dispose of their land over time to other developers. 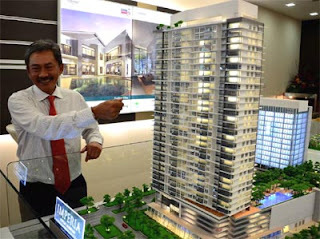 SIME Darby Bhd is targeting RM2.4 billion gross sales for the various projects it has in 10 townships for the financial year ending June 20 2012. Sime Darby Property managing director Datuk Wahab Maskan said the company has already made RM1.2 billion sales in the first half of the financial year. "We are on track to meet this target," he said after the launch of Sime Darby Property's latest property campaign called "Lifestyle Collection", a showcase of its residential and commercial properties in and around Greater Kuala Lumpur area. However, in terms of overall contribution to the Sime Darby group's revenue, it will still be maintained at about 15 per cent like in the last financial year, Wahab said. He said the "Lifestyle Collection" features 1,800 landed and strata properties which include top- selling and newly launched units as well as planned units. The properties are located in Sime Darby Property's 10 townships in Klang Valley and Nilai in Negri Sembilan which range from the cheapest residential unit in Nilai at RM431,000 to over RM1 million. Wahab, who is also Sime Darby group chief operating officer, said the conglomerate's property unit is still doing well despite the little consolidation in the luxury segment of the property market. "It is a bit challenging in the high-end market but we believe it is still reasonably strong, especially in the Greater Kuala Lumpur and Klang Valley areas," he said. Wahab added that the company's properties priced between RM1 million and RM2 million are still marketable. "(Properties) above RM2 million may face challenges to sell but we do not have many of those." On the affordable housing market, he said depending on the approval from authorities, Sime Darby Property can build between 4,000 and 5,000 units a year for five years beginning next year. "We will build our own units and we can also collaborate with the government's programmes," Wahab said. He said Sime Darby Property has also plans to look out for property deals in places it has operations like Singapore, London and Australia. Wahab said in Singapore the company is now working out one or two deals that could be the redevelopment of some old properties or a joint venture with local parties there. He said Sime Darby Property, which has a total landbank of 14,800ha, is always looking for more local and foreign local acquisitions. Meanwhile, Wahab said the "Lifestyle Collection" campaign will start today until April 14 at its property gallery in Ara Damansara. From April 14 to April 30, the public can view the products at the respective sales galleries of the specific properties. Some benefits buyers can enjoy during the period include low initial payment, cash incentives up to RM10,000 and waived stamp duties and legal fees. 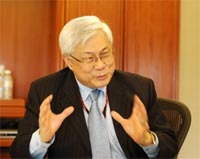 He also said properties developed by Sime Darby have high appreciative yields of about 15 per cent a year. ADSB has since exercised its rights to sell its investment in Johor's LakeHill Resort Development Sdn Bhd where it had a 22% stake, and Oriental, the remaining 78%. MPCorp chief executive officer Datuk Bill Ch'ng told StarBiz that Oriental would purchase ADSB's stake and that the new investors, if any, would be decided by MPCorp, without the restriction of seeking mutual consent from ADSB. In August 2008, a joint-venture agreement was entered into between ADSB and property firm MPCorp's wholly-owned Oriental whereby Oriental had granted a put option to ADSB to exercise its rights to sell its entire investment of 22% in LakeHill Resort Development to MPCorp on or before the expiry of the option period on Jan 31 this year. The expiry date of the option period was then extended to Wednesday. On Monday, the company said ADSB had given notice that it was exercising the put option granted to it and that Oriental was to purchase ADSB's participation in the joint-venture project. The put option price of RM110.8mil shall be paid within a period of 60 days from March 26, the company told Bursa Malaysia. It added that it was now at liberty and sole discretion to negotiate with other new strategic partner(s) of its choice. No details were given as to why ADSB wanted to end the relationship. StarBiz queries to ADSB were not answered by press time. The exercise of its option was both mutually satisfactory and friendly, he added. LakeHill Resort Development, according to reports, is currently developing Aptec City on a 638-acre piece of land in Iskandar Malaysia under its wholly-owned unit, Asia Pacific Trade & Expo City Sdn Bhd. Upon its completion in eight years' time, Aptec City will reportedly be MPCorp's jewel in the crown. As at Dec 31, loss-making MP Corp had cash and cash equivalents of RM1.6mil. Notably, its total assets stood at RM511.1mil while liabilities totalled RM125.3mil. Crescendo Corp Bhd registered a pre-tax profit of RM88.062 million for its financial year ended Jan 31, 2012, up from RM50.766 million in the previous year. Revenue for the year rose to RM290.424 million from RM215.225 million a year ago. In a filing to Bursa Malaysia today, the company said the significant increase in revenue was mainly attributed to higher sales in industrial properties. "The substantial increase in pre-tax profit was mainly contributed by higher sales as well as improved margins from industrial properties," it added. For the fiscal fourth quarter, Crescendo posted a pre-tax profit of RM23.18 million, up from RM16.122 million in the corresponding quarter previously. Revenue for the three-months period rose to RM70.610 million from RM56.706 million. Moving forward, the construction and property firm said it had total unbilled sales brought forward and new locked-in sales of RM124 million but it expected market condition to be challenging in the near to medium term. "Nevertheless, demand for property in Johor is expected to be least affected in view of the enhanced bilateral collaborations between Iskandar Malaysia and Singapore recently. "The group expects industrial property sales to be the main profit contributor but it will also start to launch residential houses in Bandar Cemerlang in the 2013 financial year," the company said. KUALA LUMPUR: Selangor Properties Bhd subsidiary Bungsar Hill Holdings Sdn Bhd (BHH) has received notices of acquisition from Mass Rapid Transit Corp Sdn Bhd (MRT Corp). In a filing with Bursa Malaysia, Selangor Properties said that BHH received the notices of acquisition in the form of Form E and Form F under the Land Acquisition Act 1960 from the Government. The proposed acquisition was intended for the Mass Rapid Transit project's Sungai Buloh-Kajang line. “BHH objected to the proposed acquisition and has filed an application for leave for judicial review for an order of certiorari to quash the notices of acquisition. The said application for leave for judicial review is now fixed for mention by the court on June 21,” it said. It added that BHH had in the meantime been negotiating with MRT Corp to seek a solution to either reduce and/or avoid the proposed acquisition of the said land. On Feb 28, BHH and MRT Corp had agreed in principle, via an undertaking letter and points of agreement, that the area for the proposed land acquisition for title no. Geran 58376, Lot 54305 will be reduced; the area for the proposed land acquisition for title no. H.S. (D) 100364, PT 5785 will be reduced; the proposed land acquisition for title no. Geran 70133, Lot 56495 will be withdrawn subject to BHH undertaking to provide the facilities and railway reserve required for the MRT station at Pusat Bandar Damansara to the specifications provided by MRT Corp. This arrangement provided under the points of agreement is not binding on the parties until a definitive agreement is signed by both the parties. Following the above arrangements, the land acquisition hearing for the said land has been postponed with no hearing date being fixed yet.